The Italian lifestyle intrigues so many people. What makes Italians so different from the rest of the world? They always seem to not have a care in the world, they love their families, they love to talk, they love to eat, and looking fashionable is always important. 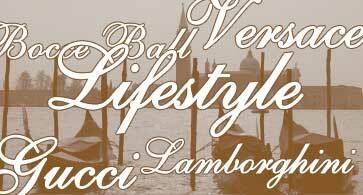 The Italian lifestyle is embraced by every Italian/American due to their family heritage (its in our blood). The Italian lifestyle in California is an attitude, and a state of mind that believes anything is possible when sharing moments with friends and family. Below are areas for you to visit that will help you discover a piece of the Cal-Italian Lifestyle. California has many businesses that are interested in promoting Italian culture and lifestyle. You will find everything from Italian language schools and film festivals to information on bocce ball tournaments. We'd like to thank these companies who have supported Cal-Italia.com in our efforts to promote the Cal-Italia lifestyle.